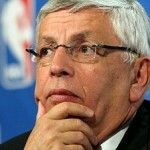 NBA Lockout: The end for the Heat? This entry was posted on July 5, 2011 by Sports Traveler. On June 30 the NBA decided to follow suit with the NFL and locked out their players. Since the NFL is the most lucrative and popular of the four major sports, the media has been all over the NFL Lockout announcing even the most minute details like the color of tie that Roger Goodell wore to each "Secret Meeting". Note to the media and the NFL: If everyone knows about the meeting it just slightly rips the meaning of secret right out of the concept. Ranting aside, for any serious NBA fan it was glaringly obvious that there would be a lockout after the completion of the 2010-2011 season. However, there was not much speculation in the media as to how long the NBA lockout could last if it even happened at all. Well here we are and as many people expected the NBA has locked out the players. It is important to note that the NBA is facing much larger issues than the NFL. The problem for the NFL is getting the owners and rookies to be a little less greedy. Whereas, many NBA owners are fighting to stay profitable. The owners are hoping to remove the current soft cap of 58 million dollars, and put a "flex" cap in place of around 46 million. Right now teams are allowed to spend more than the 58 million but they are forced to pay a luxury tax, and as of the 2010-2011 season there were 7 teams that actually spent more than 70 million (current spending "limit"). Herein lies the problem; there are giant gaps in team salary in the NBA. Some teams can obviously afford to spend more than others but that creates a lopsided distribution of the talent pool. For points of interest look no further than the Miami Heat, the Boston Celtics, the Los Angeles Lakers, and the New York Knicks. The fun will really begin if the NBA institutes a new hard cap at 55 million. All of these teams and others will face major personnel and salary decisions. The Heat, for example, will have three players (Dwayne Wade, Chris Bosh, LeBron James) that total up to 47 million just for next year. This would leave a team like the Heat in a pickle because they would be left with basically no money to fill the roster. And the Miami Heat are just one of many teams that would face problems like these and even worse financial predicaments. Would the Heat have to trade one of the big 3 just to have a full roster? Is it possible that the legendary trio in Miami will only last one year? After a whole year of hype, glory, and failure will we remember them simply as a skip in the CD or will the Heat actually get a chance to live up to all the expectations? What about all the exceptions? (e.g. mid-level, early bird, etc.) Will those still exist under the new cap arrangement? If they do, I surmise we will have to deal with Wade and his two girlfriends for at least the foreseeable future, if not the full six years they have left on their contracts. Another question, though a bit off topic...Why doesn't Riley trade James for Howard? I'm sure Orlando would be more than happy to oblige, and Miami would most assuredly be a more balanced team. In my opinion there has never been a more overrated player in the NBA than LeBrick. Perhaps he is the most talented player to ever lace 'em up; but he has no heart, no drive, and no will to win (See 2011 NBA Finals, Game 5 vs. Celtics 2010). I cannot stand people who even dare utter his name in the same sentence as greats like Magic and Michael. This guy is nothing more than a big cry baby, and he'll be hard-pressed to even win one ring, let alone seven. All of your points are valid and it is hard to tell what will happen with mid-level exceptions, etc. The NBA knows they have to change the salary structure but it is unclear how they plan on doing so. Much of the information suggests that the plan for the NBA is not going to take shape over a year or even two. Many people say that the new CBA will result in changes they may take up to 5 years to see the real benefit. This is why the NBA is in a bad spot. From a fan perspective it is hard to get behind a sport that maybe be unstable for years to come. 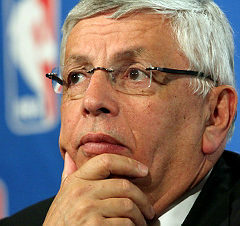 Another problem is David Stern really wants to get involved in Europe. There has even been rumors that he wants to get rid of the East and West conferences and have a Euro League and a U.S. League. The winners of which would meet in the finals. Thanks for your comment and we look forward to hearing from you again soon.